*I originally published this article on my wordpress blog in 2011. I wanted to finally transfer it here, and I updated it somewhat as well. Hopefully some of you will find it helpful when photographing your own crafts! When it comes to photography I was always one of those people who looked with awe at great photographs. I have friends who take amazing photographs as their hobby. I have sisters who took the time to learn about photography to take great photos. I always told myself I could never do that. I was lucky if my photographs were even in focus! When my husband bought a digital DSLR camera several years ago I thought he was pouring money down the drain. Boy have I come a loooong way since then! From only being able to use the basic settings on a point and shoot digital camera to being able to use the manual settings on the DSLR camera to get a great photo. I have read my camera’s manual as well as numerous articles and tips on product photography. I know I still have a LOT to learn and I can’t wait to see what my photos will look like in the coming years! In the meantime I’d love to share with you some of the top lessons I learned about photography so far in hopes that it will also help you on your journey to great photographs! 1. Edit your photos once you’ve uploaded them onto the computer! I don’t usually use any complicated photo program yet, I just use iPhoto. But it is enough to allow me to brighten photos, change the intensity of colors, play around with the white balance a bit, etc. It cannot make a bad photo look great, but it can help make a great photo look awesome! 2. Do NOT use just a built in flash when photographing small products. It gives glare and makes the colors look off. It just does not look good. There is a whole world out there I have not yet learned about using outside flash, bouncing, lighting, etc. Hopefully I’ll be able to try out some of those things in the future. But right now as I only have a built in flash, and I know it does not look good with my small product photography, I stick with using the next few tips to get good lighting results in my photos! 3. Learn how to use the custom white balance settings on your camera if you have them. I learned early on that the auto white balance for my camera did not give the best color results unless I was using natural light. Sometimes I have no choice but to use indoor lighting, which in my house can be quite yellow looking. Using the custom white balance helps the camera adjust for that and gives me some great photos! 4. Learn how to change the brightness settings on your camera if possible. This allows you to take a brighter photo when the light just isn’t quite enough to make your colors look right. Yes, you can edit on the computer afterwards, but the results are much better if you can change the camera settings in the first place. To do this you may have to read your camera’s manual (something I thought I’d never do!). For my camera I cannot change the white balance or brightness if I’m on auto mode, so I had to learn how to use the manual modes to adjust these settings. It is a lot easier than I thought it would be. Often I’ll adjust the brightness level and take several photos, some brighter and some not as bright. It can be hard to tell on the camera what is the best amount of brightness. Also, keep in mind that when you make it brighter, it will take the camera longer to take the photo. So to keep it clear and in focus, you’ll need to use a tripod (see tip #7). 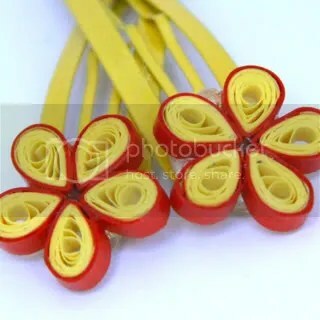 *Currently I have a toddler at home which means I usually only get quilling work and photography time after bedtime. Which means I don’t usually get a chance to use natural light (always the best!) so I use the white balance and brightness levels a lot to get decent photos. In the next year or two I hope to get back to being able to use more natural light to get those great photos! 5. Use natural light when possible. All of the photos that I have taken outside have turned out better than photos I have taken inside and I have had to do much less color editing on them. At first I would use natural settings for my products such as tree branches. This can look really neat, but it can also be a bit distracting depending on what your product is. I now try to use mostly white, neutral and/or solid backgrounds for simplicity. It’s not always easy to drag all of my photography and prop equipment outside for a photo session, and it’s either HOT or raining here, so I have found a window in my house that is nice and sunny in the mornings. If I set up my equipment there I have an hour or two each morning to work on photography if I desire, in the comfort of my home! 6. Build or purchase yourself a lightbox . I used this tutorial: http://www.digital-photography-school.com/how-to-make-a-inexpensive-light-tent though I know there are many other great ones out there as well. Using my homemade lightbox (which I made completely out of materials I had in my home!) I was finally able to take photos indoors at night if I needed to. I now have a second lightbox that I use as well, which is just 3/4 of a box lined with white paper, no draping fabric or anything. I have to adjust the angle of it to make sure I don’t get big shadows on my pieces, but sometimes it gives better results. The one linked to above gives better results if you have a shining light right into it. 7. And the latest lesson that I have learned is that you can get much better photos when using a tripod !! This is a lesson I did not want to learn. Why go through the trouble of setting up a tripod if I don’t have to? Why do I have an expensive camera if it can’t handle a not perfectly steady hand? But after having been told time after time that some of my photos are just not quite clear I decided to give it a try. And I will never go back! 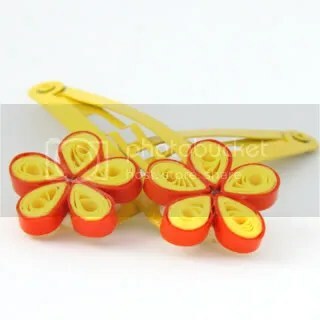 Here is an example of a photo of some hairclips. I took both of these photos using natural light in my lightbox (on different days). I was astounded by the difference in the clarity! Once I saw how the second batch turned out I couldn’t believe that I had thought the first photo was pretty good. In comparison it’s quite bad! I saw this difference with many of my photos. 8. This last one isn’t really a tip, but I wanted to throw in some encouragement at the end. Keep trying to get better! Many times I’ve thought my photos have turned out great. But I kept reading and trying out tips, new techniques, lighting, placement, etc. and they just keep getting better. Now I see the first photos that I posted on etsy and I cringe. I hope that in another year I do the same for the photos that I am taking now because it will mean that I have gotten that much better. Never give up trying to improve! I hope that some of these tips have gotten you motivated to try some new techniques and learn a bit more about product photography. The only way to get better photos is to keep using your camera and trying new things. Have fun along the way, and feel free to pat yourself on the back when you’ve discovered something new that works for you! **Next up I hope to eventually be able to purchase a macro lens for my camera so that I can take better closeups without having to crop pictures so much. Can’t wait!! Great Post Honey, photography isn’t my strong point, but reading your blog has made me realise how important it is.